Burdock root is long and slender, growing anywhere from one to three feet in length. Above ground, the burdock plant looks very much like a common weed with long-stemmed large leaves and purple thistle flowers. The root is often hand-harvested to prevent the root from breaking off in the ground. Its coarse, thin skin is typically covered in dirt. Once scrubbed clean, Burdock root is a rusty beige color with an appearance similar to a brown carrot; its flesh, a crisp off-white contrast. The root is sweet, mild and earthy with a taste similar to artichoke; some say the flavor can be slightly astringent. Burdock root's white flesh can oxidize after it is peeled, to prevent this and to remove any astringent taste, submerge the root in water with lemon or vinegar. Burdock root is typically available year-round, with a peak season in the summer through the fall. Burdock root is a perennial plant, scientifically Arctium lappa, sometimes known by its Japanese name 'Gobo' or Japanese Burdock. The taproot is used throughout Southeastern Asia as both a vegetable and a flavoring agent. Burdock is a member of the thistle family and is known for its purple flowers that turn into prickly burrs that will eventually spread its seeds. It is used in Asia for both medicinal and culinary purposes. Burdock root is dried and powdered or made into an oil extract for use as a dietary supplement as it has anti-inflammatory, antioxidant, and antibacterial properties. In Chinese medicine, Burdock root is combined with other ingredients to make a sore throat remedy and a treatment for colds. Dried or roasted pieces of Burdock root can also be steeped in hot water to be used as a tea or poultice. Burdock root is high in fiber and minerals, and is a good source of potassium. 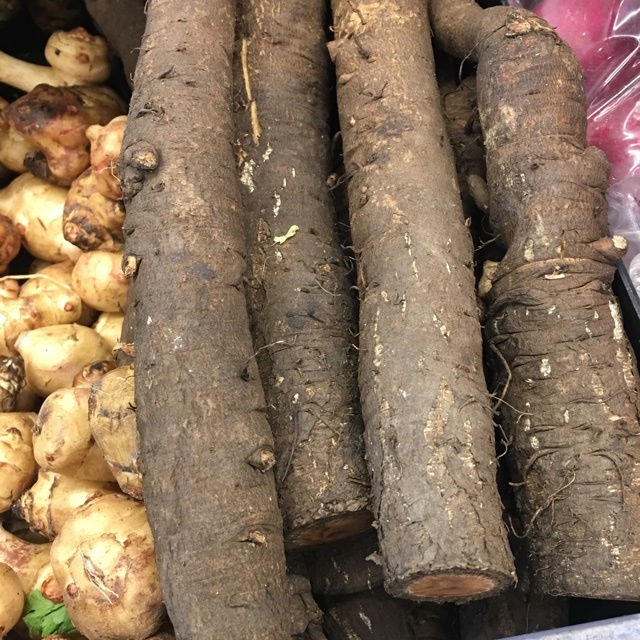 Burdock root is a traditional Asian ingredient often found in stews, stir-fry, and braised dishes. To prepare Burdock root, scrub or peel depending on the thickness of the skin and soak in acidulated water to prevent oxidation and to remove any astringent taste. Slice, julienne, or cut into chunks, Burdock root’s starchy qualities lend themselves well to frying and baking. Burdock root adds a nutty, earthy flavor to grains when simmered with them. It is often used as a seasoning agent for various dishes, though it can be served as a side dish or pureed into a soup. Burdock root can be kept refrigerated for up to two weeks and should not be washed or peeled until just before use. Burdock root is especially popular in Japanese cuisine. In Japan, 'Gobo root' is often sliced thinly into coin-shaped pieces, fried and served as a chip-like snack. It is also an essential ingredient in the Japanese dish kimpira, a type of slaw made with julienned Gobo root, carrot, dried chili peppers and soy sauce. The long root is commonly pickled in rice vinegar and served alongside sushi. The Japanese have also been known to eat the young, tender leaves of the Burdock plant. Burdock is native to Siberia and Eastern Europe. It is primarily cultivated for culinary use in Japan. Burdock grows wild along roadsides and around field boundaries throughout Britain, Europe and North America, though not in the southern regions. It was brought to America in the late 1800's where it was considered to be a flowering weed. Burdock is mainly grown for commercial consumption in Hawaii, California and Japan. Recipes that include Burdock Root (Gobo). One is easiest, three is harder. People have shared Burdock Root (Gobo) using the Specialty Produce app for iPhone and Android. 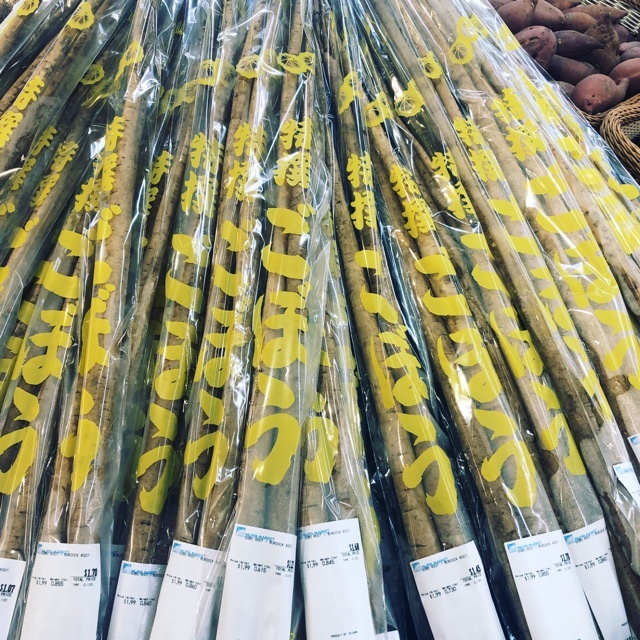 Sharer's comments : Fresh Gobo root! 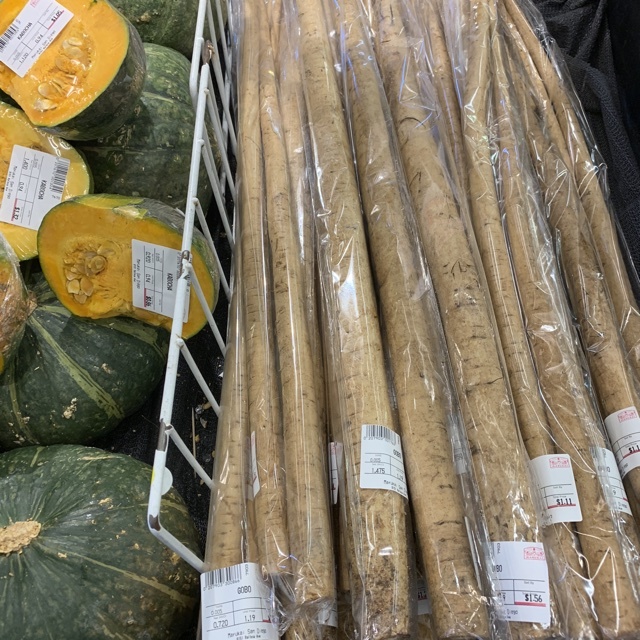 Sharer's comments : Burdock Root spotted at Nijiya Market. Sharer's comments : Burdock Root spotted at Cornucopia. 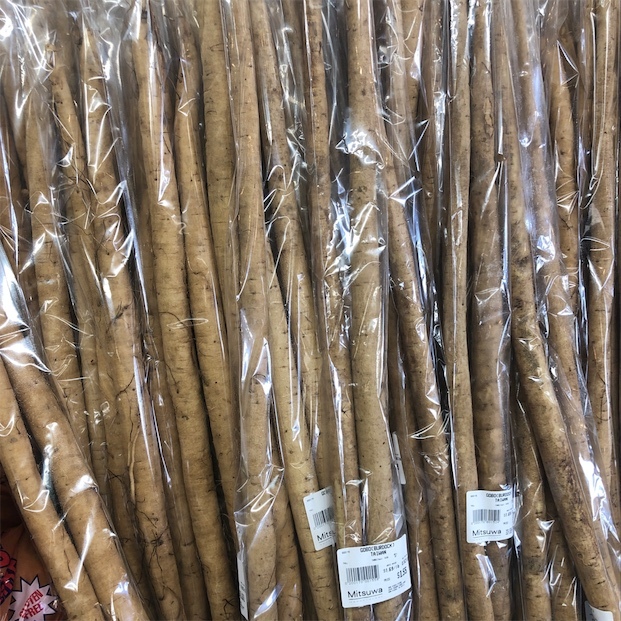 Sharer's comments : Burdock Root spotted at Marukai Market. 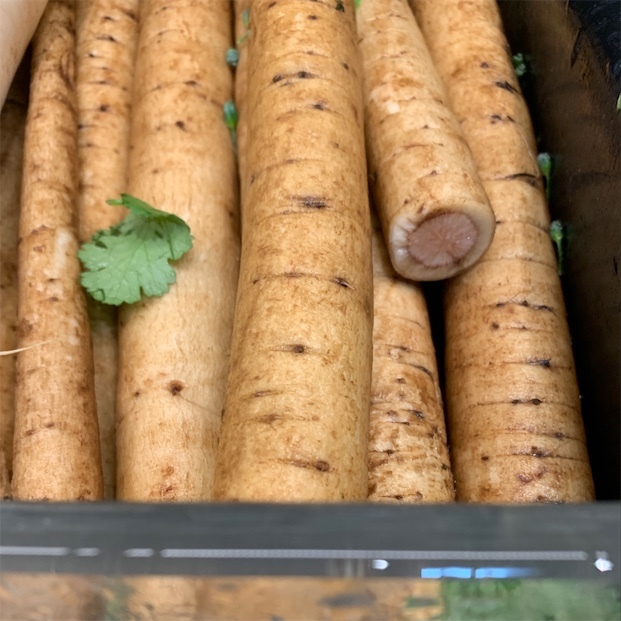 Sharer's comments : Burdock Root spotted at 99 Ranch Market Concord CA. Sharer's comments : Burdock Root spotted at I can not find this item if u see it please let me know. 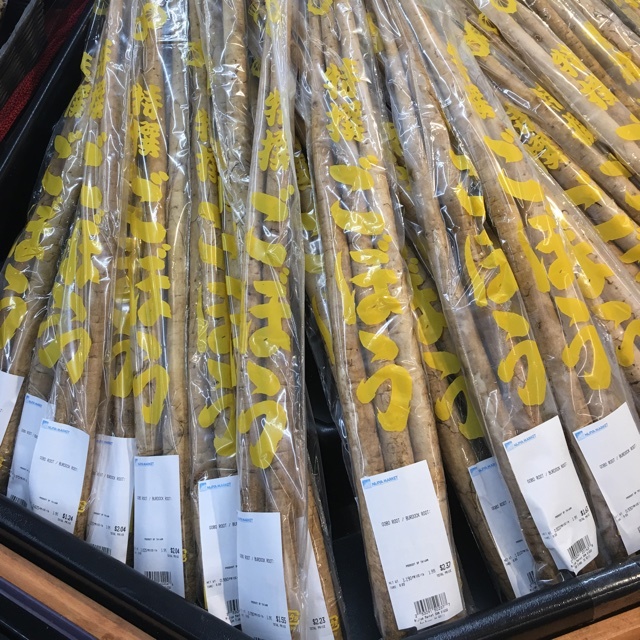 Sharer's comments : Burdock Root spotted at Whole Foods Market Beer, Wine, & Liquor.